The town and place name derives from the discovery of alum in the Tolfa Mountains in 1461; the finding of this mineral was attributed to Giovanni da Castro, a Papal State Commissioner. The terms of the "Le Lumiere" "Le Allumiere"and "LA Lumiera" indicated the site in which the alum mines and plant for the production of alum could be found. Initially the mineral was extracted from the mountain by means of wide crevices, a technique that dramatically modified the natural landscape of these mounts. Only later in 1853 the technique of opening underground galleries was employed. However, Allumiere's "true" founder was Agostino Chigi from Siena, better known as quot; the Magnificent", who was the mine's contractor between the years of 1500 and 1520. It was he who moved the quany site, relocating it to the foot hills of Monte Roncone, the present day "Monte delle Grazie". Here the village was established, initially named "Monte Roncone", which later took on the name of Allumiere. Chigi's industry for the extraction and production of alum developed into the largest mineral works of its time. 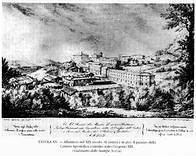 In 1788 the French scientist Chaptal invented artificial alum creating a deeply rooted crisis Within all natural alum mineral works. Due to this number of events and the increase of the town's vastly growing population, the new Municipality of Allumiere was instituted on the 14th of June 1826. 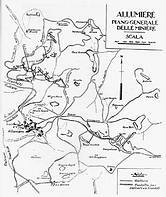 This date also marks the beginning of the discord between Tolfa and Allumiere in relation to land divisions, which was successfully resolved thanks to the intervention of Cardinal Mertel on the 28th of May 1868. Click here to see"North from Rome"
Click here to see "Mertel page"